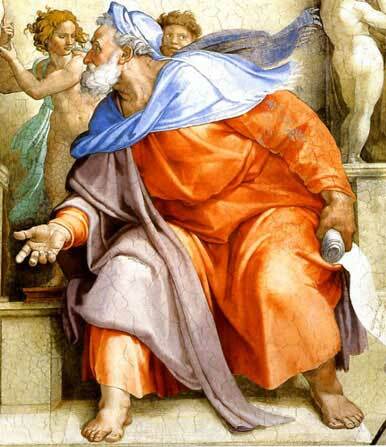 The Prophets and Sibyls of the Sistine Chapel. 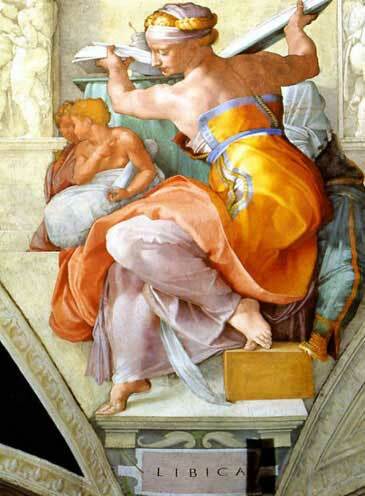 Michelangelo's Prophets and Sibyls painted in the Sistine Chapel are commanding works of art in their own right. These figures, are the largest on the Vault of the Chapel. 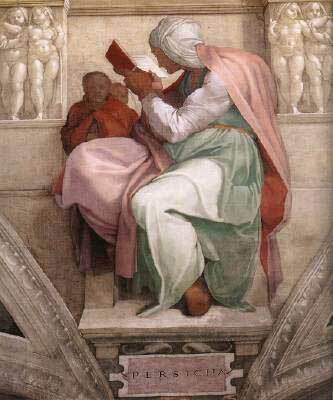 Around the centre of the ceiling of the Sistine Chapel are twelve prophetic figures all representing the coming of Christ. Seven of these are Israeli Prophets, and the remaining five are the female Sibyls of the Classical World. 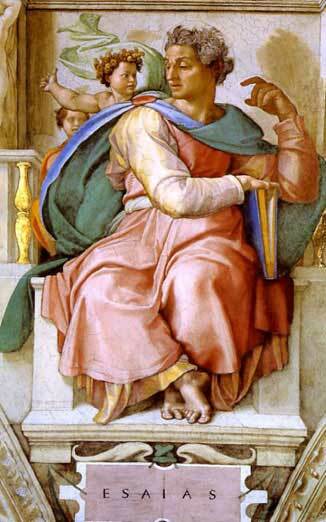 The alternating male and female figures are seated on thrones and are depicted reading manuscripts, books or scrolls. 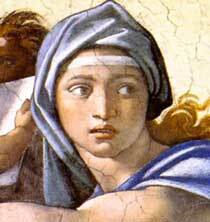 The pagan Sibyls have been included to symbolise that the Messiah was to come for all the people of the world and not just the Jews. 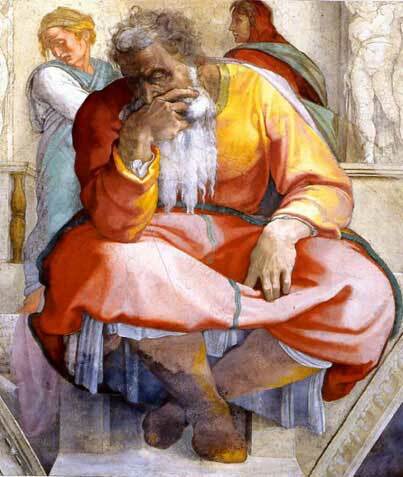 They are- Jonah, Jeremiah, Persian Sibyl, Ezekiel, Erythraean Sibyl, Joel, Zechariah, Delphic Sibyl, Isaiah, Cumaean Sibyl, Daniel, Libyan Sibyl. 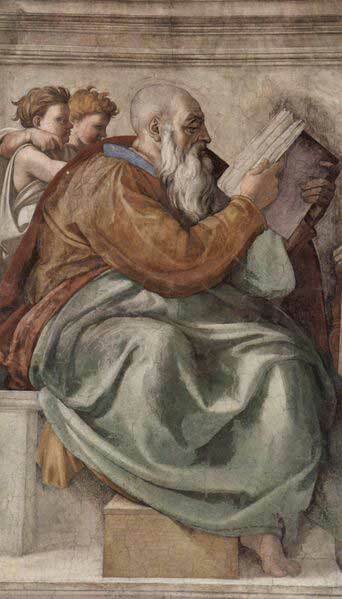 Here Jonah is seated on a throne with a large fish by his side. This represents the belly of the whale that he is reputed to have spent three days inside. 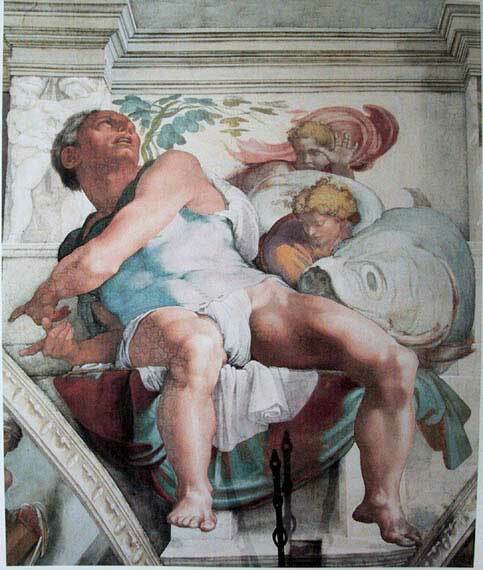 The figure of Jonah is seated above Michelangelo's fresco of the Last Judgement, at the south end of the chapel, directly opposite the prophet Zechariah on the north wall. 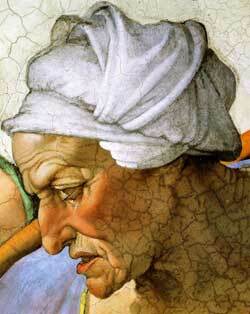 Certainly, The Delphic Sibyl is one of the better-known works in this series of prophets. She is the oracle at the navel of the world. Reputed to be descended from the Sea-God Poseidon and sister of Apollo. For an artist of his stature, the answer is undoubted yes. He just seems to be more interested in the heavy male body than any delicate interpretation of femininity. 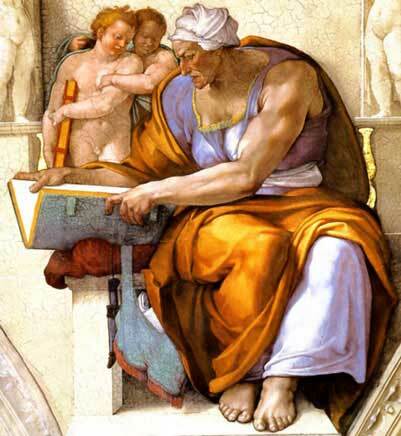 Just look at the muscular form of the Cumaean Sibyl above, it is intended to be a rendition of an aged old woman but she looks like an Olympic hammer thrower! 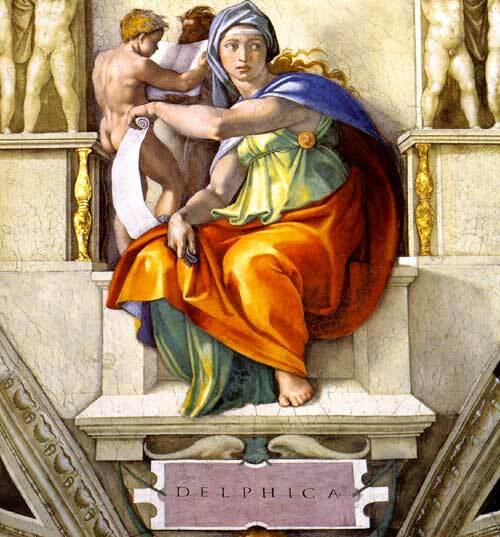 Even the Delphic Sibyl (scroll up) who has at least the features of a female, seems to have very male like arms almost as if the head of a woman has been transplanted onto a male body. 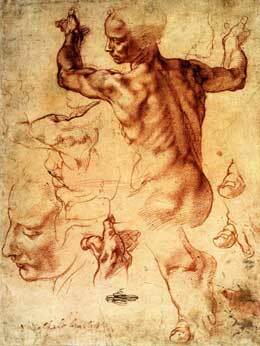 It could be that the way Michelangelo depicts the human form is directly related to his own sexuality, or.... perhaps all Renaissance women were very well fed! 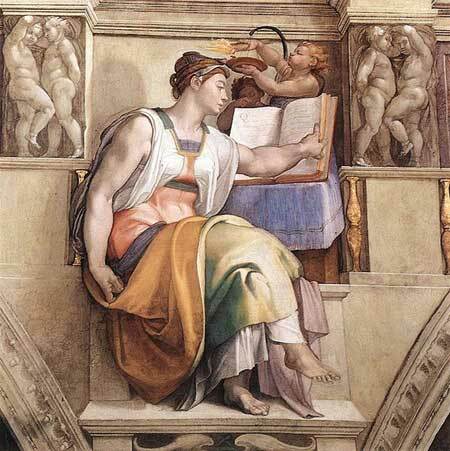 The Libyan Sibyl is one of the more graceful female forms painted by Michelangelo. From the detailed studies, we can see the care that has been taken to get the balance and posture of this figure just right. 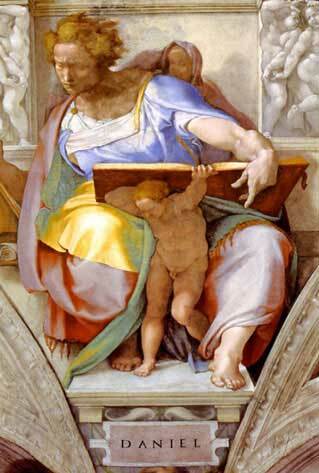 Look at the work that has been done on the left foot, the separation of the big toe is a testament to the skill of an artist who has focused on anatomical accuracy down to the smallest detail. 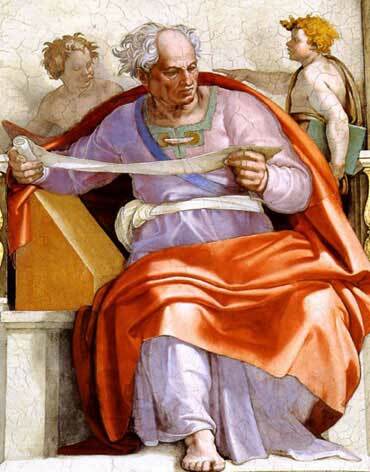 The complex twisting motion of the torso animates the Libyan Sibyl as she opens her manuscript of prophecies and glances downwards at the chapel floor, sixty feet below.